Bespoke AV Wall Plates, Floor Plates & Rack Panels; designed, manufactured, branded and installed by the experts. Not only can we design your ideal plate with a choice of termination options including: solder, tails, screw terminal and practically any other termination. We also can provide detailed colour print or engraving of your logo to really showcase you, or your clients brand. Plates are manufactured efficiently, ensuring where possible you aren't waiting around for your plates, and we'll even help professionally install them for you. You can read a little more about our services below. With audio visual installations at heart, our team have the knowledge and experience to advise and design. Right from the outset, AV Plates was formed to offer bespoke and custom products to the market, coupled with the ability to design with installation practicalities in mind. From initial customer enquiry we will listen to the needs of the user, and often from our own experiences we can advise and suggest alternatives and improved ways of design and installation. We can then create drawings and visuals to document our ideas, ultimately for further discussions and amendments. Once designs are approved, we can initiate the manufacturing process. Our fabrication facilities, give us access to a wide range of raw materials and machinery. We therefore have the ability to create almost any panel. Often when manufacturing custom sized panels we will start with a piece to sheet material, once fabricated to the required size, we will carefully create cut outs that follow the contours of connectors allowing a snug and secure fit. Often, for standard sized panels we will choose to utilise manufacturers blanking panels. This proves to be cost effective for customers and allows users to match existing decor as required. Once we have a finished product, we will populate the panel with its connectors. AV Plates prides itself with the ability to mount almost any connector. The service that puts AV Plates above the competition is branding. 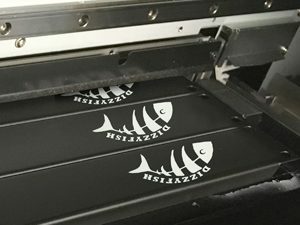 We have state of the art printing machines that allow direct to surface replication of customer logos and other branding. At the offset, during the design process, branding will have been discussed and finalised. Full colour, high resolution branding shows a sign of quality and provides excellent resale opportunities for dealers. So why should you compromise, when you can have the plate that you need? Our roots lie in our trade only installation services. We have years of experience installing all types of AV, from simple 'hang and bang' installs like interactive whiteboard systems, right through to full board room control systems with multi signal switching. We even offer control system programming in our portfolio of services. This, above anything, gives us a practical take to produce AV Plates that are designed and manufactured, to ensure suitability, reliability and practicality.